Some of the most effective, eco-friendly beauty remedies can be easily made with ingredients in your fruit bowl or kitchen cupboard. As one of the world’s most-photographed women (with numerous Vogue covers and a beauty contract with Estée Lauder under her belt), it’s difficult to believe model Kendall Jenner once suffered from spots. Her clear-skin solution? A home-made spot treatment to zero in on blemishes and a DIY mask applied weekly. Jenner is not the only one turning to home-made beauty solutions. Women interested in a more natural approach to their skin routines are phasing out parabens and other chemicals and concocting their own home-grown recipes, with ingredients available at your local supermarket. Here, four easy treatments for you to try, plus two ingredients no gal should be without. From a glow-giving face mask to a cellulite-fighting body scrub, we’ve got your back (and face). Method: Mix one well-beaten egg white with the juice of half a lemon. Apply to clean skin and leave for 30 minutes before rinsing and removing with a face cloth soaked in warm water. Why it works: Egg white is packed with protein and amino acids and works wonders at tightening pores, while the acidity of the lemon will help with spots. Method: Mix ingredients together (making sure they’re well combined) then apply to individual spots and leave on overnight. Rinse off in the morning. 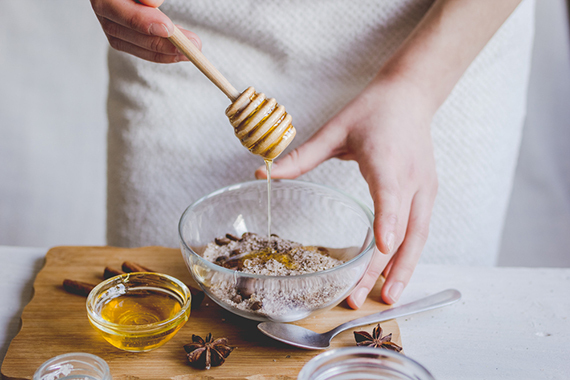 Why it works: Honey has antibacterial properties so it will help to keep skin clear, while the acidity in the lemon and baking soda will help remove oil and shrink spots. Another suggestion for spots: dab a little apple cider vinegar onto a cotton pad and wipe the affected area. Apple cider vinegar has antibacterial properties and is high in minerals. Dilute it slightly with water if you have dry skin. Method: Mix the sugar and olive oil together. Apply in circular motions after you’ve been under the shower or soaking in a tub for a few minutes. Rinse off. 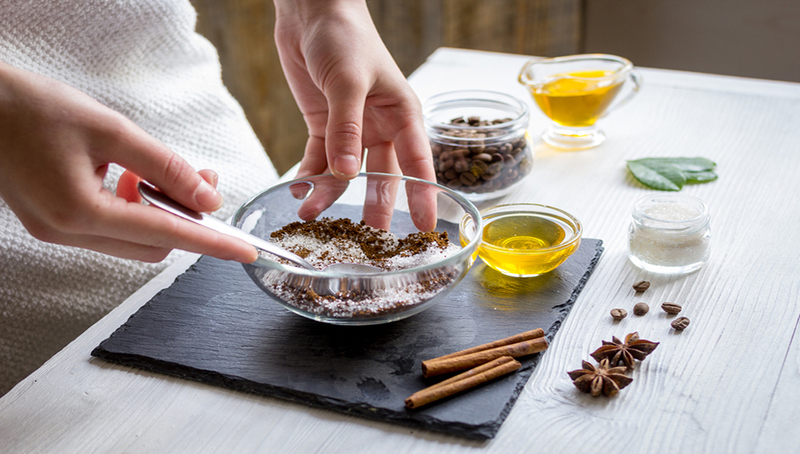 Why it works: A body scrub is a fast and effective way to crash-tackle dry skin and turbocharge circulation which, in turn, helps fight cellulite. If cellulite is a big concern, add a couple of tablespoons of ground coffee to the scrub. The caffeine is a stimulant and will help boost circulation (sluggish circulation is one of the chief causes of cellulite). Method: Mash the banana and avocado together and stir in the honey. Apply to your neck and face, avoiding the lips and eye area. Rinse off with a face cloth soaked in warm water. Why it works: Banana is packed with potassium (which helps keep skin hydrated) while avocado is full of nourishing oils and will rapidly calm inflammation and redness. Honey is antibacterial yet hydrating as it’s a natural humectant. Got a big event coming up? This mask is the perfect pre-party prep for glowing skin. Like your beauty products simple yet multi-purpose? Then you shouldn’t be without coconut and olive oils. Coconut oil can be used to remove make-up or in your hair overnight as a treatment. Simply wash it out in the morning with your normal shampoo. It’s antibacterial and also makes a fabulous body moisturiser. Olive oil is a wonderfully easy hair treatment as it contains amino acids to help rebuild damaged strands. Apply two tablespoons to your mid-lengths and ends and leave in overnight (use an old pillowcase or cover your pillow with a towel) before shampooing out in the morning.